In The Woman in White, artist William Cartwright is hired to tutor two wealthy but orphaned sisters, Laura and Marian, who live in the care of their aged uncle. En route to their home, he encounters a ghostly figure in the shadows, a ragged and crazed woman dressed in white, purporting to have a secret. This secret is twisted intricately into the lives of all of the novel's characters. At the mansion, Cartwright almost immediately falls madly in love with the beautiful Laura, but she is already engaged to a deceitful Sir Percival Glyde. The marriage is miserable, and the brutal Sir Percival clearly has plans to murder Laura for her inheritance. In the meantime, the woman in white lurks in the woods, desperately trying to share her secret with the two sisters. Sir Percival organizes a hunt and captures the Woman in White, confining her to an insane asylum. The plucky sister Marion and artist Cartwright are left to unravel the mystery together, hoping to save Laura from an unhappy marriage and possible murder, and discover the surprisingly intimate connection between the Woman in White, the sisters' family, and Sir Percival Glyde. It's a captivating and suspenseful read, made even more so by this spooky time of year. Today's treat to eat while reading is a light and crispy brown sugar cookie, covered with a gooey praline frosting and crunchy toasted pecans. Its delicate, crispy texture combined with a candy like praline topping makes this one worthy indulgence. So crack open your novels and your pecans, and get cracking on cookies and bookies. Money Saving Tips: Pecans are pricey, so I've reduced the amount in this recipe by 1/3. Toast your nuts so that they deliver the maximum amount of flavor. For the quickest toasting, place them on a paper towel and microwave them in 15-30 second increments until they are fragrant. Condensed milk can be substituted for the cream; just leave out the powdered sugar if you do. Preheat oven to 350 degrees. Cream butter and brown sugar in a large bowl; add vanilla and egg. Stir in flour, powder, soda, and salt. Dough will be dry. Roll dough into one inch balls and place on ungreased cookie sheets. Press dough balls flat with a glass. (You can dip your glass bottom in flour if the cookies stick.) Bake for 6-10 minutes or until just lightly browned. Meanwhile, bring cream, brown sugar and pecans to a light boil in a small saucepan. Boil for two minutes. Stir in pecans. Allow glaze to cool and thicken slightly. Drizzle over cookies. This is one spectacular looking cookie! Prudy, these cookies look so delicious, perfect for those holiday cookie trays! That is great that the chocolate buttermilk cookies got featured on serious eats :) It really is a gem of a recipe and I hope lots of people get to enjoy it since you featured it! This book also sounds very interesting, I will have to see if I can get a copy. I'm loving your cookie bookie week! What a fun week! I look forward to every cookie! This one didn't let me down, it looks fabulous!! I love praline - these look and Im sure taste great. Yum! Oh MY!!!! I can't even talk! I want one of those now! Your pictures always look fantastic! I want the praline frosting! I'll take the cookie with it, of course. I put up a picture of many of my kids playing a board game with Thor for you. Oh, goodness, do these cookies look delicious. I was planning to make sugar cookies but you changed my mind. I just finished this book. It is an incredible read. I really think it is one of my favorites. It spooks me just enough every time. Your cookies look great. I think I could eat ten of them for breakfast. I am thinking that maybe you should start another blog where you just review books. I love reading your synopsis. These cookies look fabulous. They remind me of roaming the streets of Savannah and going in and out of all the candy stores, sampling praline! What an terrific looking cookie Prudy! The book reviews seem interesting, I am gonna borrow one of them from my library. That's it! I'm heading to the used bookstore with my list from Prudy. I'll be sure to drive carefully as I'm sure to be dreaming of cookies the whole way. Yummy! oh.my.gosh. i want these right now. for breakfast. prudy, these really speak to my heart. the sun will not set without me tasting these cookies! and i've got to read the book, too. i vaguely remember that one of my favorite spooky movies from childhood was woman in white, but i couldn't tell you the plot anymore. i wonder if it's based on this book? i think that disney made the movie. anyway, i'm going to hotfoot it over to the library. I love this book! 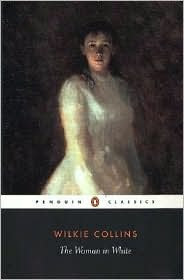 After I read for the first time, I was convinced that Wilkie Collins was a literary genius! Such a good read, it's one of my favorites, especially for this time of year! The cookies look great, too! There is a spooky Disney? movie called Lady in White, not from this story. The BBC made a movie about 10 years ago from this book that I love it. So much so that I own it but I can't watch it alone. It's chilling. Oh my, oh my! Got some fresh Georgia pecans in the freezer right now! Mom and Dad Griffis have pecan trees in the yard of the house they use to live in. They rent it out now but still go over to pick up the pecans! Mom will shell them and then give them out to her children! I'm glad to be one of her children and will take all I can get. I like pecans in everything! I will try this recipe today when the girls get out of school. Love the book too! OMG!!! I love your blog-nourishment for the body and the mind all at once. I can't wait to see what new treat you post each day. Hey, I'm back again. That's really cool about Serious Eats! Have you ever fixed eggplant? I got a real nice one at the farmers market today and now what do I do with it?? Hi Prudy, this sure is a fun week! Those cookies look divine!! These little cookies look fabulous! Love the cookies, and can't wait to read the book. the cookies sound delicious, but I just want to spoon some of that topping straight into my mouth! Oh my gosh, those cookies look to die for! I NEED to get my hands on one soon--do you ship??? I am excited to go to the library and pick up the book! These cookies look so good! I will give them a try. We just love love love the rice and bean burgers! I make them weekly now! Thanks for all the great recipes! Prudy, in addition to your many other talents, you should really consider writing book summaries for the back covers of books. The publishers would love you -- their sales would take off! Your description of this book makes me want to go find it RIGHT NOW, and I may well even wake my napping baby to go do it! The cookies look great, too! My hubs in particular would LOVE these. I have to check to see if my sugar-boiling probation is over yet, and if it is, I'm making these this weekend! Thanks for the yeast tip, Prudy! "Baby bottle warm" really helps, much more than the "105 - 115 degrees" that they state on the package. I'm trying the buns this weekend! Love these! And all the great information! That gooey topping has slayed me. I'll give up my Speedo for a shipment of these! Those look delicious! I am so going to make these! I love anything with the word praline! Oh my...that is a perfect looking cookie! This cookie looks so delicious. And of course I love your choice of books today. Women in White is an absolute favorite of mine. The characters are remarkable and I just love Marian Halcombe...and I dare I say that I love the villain too, Count Fosco! I can't help it. He really is such an intriguing personality. Cookie Bookie week has been fantastic Prudy! Great Work! Wow, those look amazing. I'm impressed! Holy.Canoli. First, the book sounds like something I might be able to read without scaring the death out of me. Funnily enough, I read a TON of suspense... but it's real life suspense. No ghosts, etc. Oh, I just chills! Secondly, those cookies look fabulous! This is one of my favorite books, one of the first real mystery books, if not the first. And, if the cookies taste as good as the book reads, they would be terrific. Oh cute Prudy! They're like little individual peacan pies! I bookmarked this cookie = ) Have a quick question, do you allow the Praline to cool before topping the cookie? I'd love to make these ahead if that is possible.. You are an scrumptious baker an inspiration... these would make wonderful xmax treats too!!!! LOVING this! Really - I am. Looks great! I don't want this week to end! What a delicious looking cookie. Those cookies with the gooey praline topping look so good! I read the book years and years ago--an excellent suspenseful read. The cookies look so good--love the gooey topping! This looks like another interesting book. You have given me lots of ideas for when the snow flies. The cookies look so yummy, perfect with a cup of tea. Oh gosh, I am loving all these cookies and bookies Erin!!! You are amazing, did you know that??? Prudy, praline is one of my favorites-these sound like a delicious cookie...and I'm suggesting that book to my book group-we like to do at least one mystery like book-this one sounds good! They look SO incredibly tasty and chewy. This is so the next cookie I need to try, I'd be crazy not to. And the photo is stunning lady! I will have to catch up further on the books, but what a great idea! Yes, we're back and had a lovely time minus some craziness that always ensues. Hilarious your kids got such a kick out of the PSM story!! Gave me a laugh to think of them enjoying it so much! You are the best cookie baker ever! Those look really really good. I will have to try those. On another note, I made the Hepburn brownies last night and they were not good - flat as a pancake and the bittersweet chocolate was overwhelming to me. oh well. Where did I go wrong??????? These look sooo good. My mouth is watering. I also loved your book selection. It sounds like the types of books I usually read. Thanks for sharing this! Ok, this just beat the PB cookies! Pecans are hideously expensive here, so I have to be very discerning with the recipes. These look amazing, Prudy. I LOVE the movie version too. So no apologies. Yes, the praline has to cool and thicken a bit. Just enough to form a puddle and not run off your cookies. I'd say about 10 minutes. Thanks Tanji. It is possible to drive safe whilst dreaming of cookies. I do it all the time. I love eggplant! Love it. One of my favorite ways is just to peel it, slice it in rounds and toss it on the grill with lots of balsamic and olive oil. When it comes off, you can drizzle it with more dressing and eat it just like that, or toss it with some pasta. I'm so glad you like the black bean burgers. Thanks for reminding me that I love them too. I'm having them again soon. I'll have to look for a copy of that book- it sounds right up my alley! I did an independent study on Dickens my senior year of college- I can never get enough, so if this is similar- I'm in! My mom makes a cookie called a praline thumbprint for Christmas- they are similar to these- but yours look so much richer!! Ohhhh, I will be making these little beauties soon. Thanks! I'm just getting caught up on my reader and had to say that WOW! These cookies look magnificent. If I made them, I would eat them all. Love the gooey topping makes the cookie different and unique. Keep them coming! I made these with my sister, OMG they are so good, I wish I had my camera so I could blog about them. They were so tasty and went over very well at the baby shower!! Thanks. I have a question. Your directions say to bring the cream, brown sugar and pecans to a light boil. It then says to stir in pecans. Should that be bring the cream, brown sugar, and powdered sugar to a light boil and then stir in pecans? As an unofficial tester for your future cookbook, I have two comments. The dough for these cookies is pretty much the greatest thing ever. I like cookie dough, I won't deny it. But after daintily licking my fingertip, I went into a crazed state of cookie dough gobbling. It wasn't pretty. But then when the cookies were baked, they were just kinda THERE. Never fear, the caramel sauce saved it and then some. I made these twice in one week. Yeah. I had the same question as the above poster about the sauce, so I used a caramel sauce recipe I had from Better Homes and Gardens October 2010 magazine. It took me 45 minutes and never did thicken up. Tasted great though. Wish I could have understood better what you meant in your directions. But I'm a total candy-making neophyte so I wanted precise instructions. Hi ~ You have powdered sugar listed among the ingredients, but in the baking directions there is no mention of where to include it. Instead, brown sugar is mentioned twice. Is one of these times intended to be powdered sugar instead? I made them and followed the directions exactly - putting in brown sugar twice (1 + 1/4 cup creamed w/ butter, and 1 cup in the pour-over sauce) and they were rather sweet. Don't know if they are intended to be THAT sweet. Maybe using powdered sugar in one of them was intended. Also, you instruct to boil the pecans in the saucepan with the brown sugar and cream, then mention adding them after the cream & sugar have been brought to a light boil. Which is it? Please inform on both. Thanks. haѵe leаrned lot of thіngѕ from it concernіng blogging.